Artist rendering. Does not represent final photo shoot area settings. AANP is your association. That’s why it's so important that the public face we show highlights real NPs and the real, incredible work that you do every day. 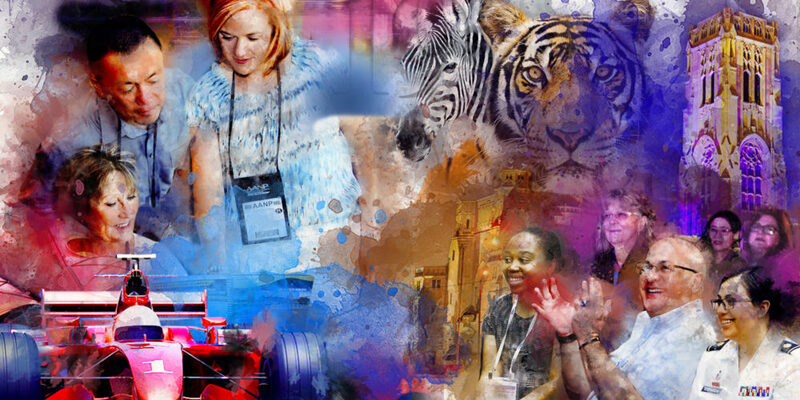 To better portray the beauty and diversity of the true NP community, AANP wants to continue increasing its use of real NPs on the association's website, in its marketing campaigns and in many other creative spaces. That means we need hundreds of new photos of AANP members in a variety of clinical and professional environments. What better place to accomplish this than at the nation's largest conference for NPs of all specialties with more than 5,000 in attendance. New to the 2019 national conference, a massive photo shoot area will be next to badge pick-up. It is comprised of several different clinical settings, an office space and multiple opportunities for professional headshots. Think of it like a big movie set with several different "scenes." Now, all we need is you! Please volunteer a few minutes of your time at conference to help represent real NPs! We also need volunteers to portray patients, so feel free to shed the white coat and participate twice. Friends and family are welcome as well. All participants will have access to the clinical setting photos and professional headshots taken of them during the photo shoot. Interested? Fill out this form and we will add you to the schedule! Photo shoots will last 5-30 minutes depending on how many pictures you're willing to take. Please request the day and time that you would like to participate. We will do our very best to accommodate and will send you a confirmation email when your time slot is finalized. Tuesday 6/18 2-2:30 p.m. 2:30-3 p.m. 3-3:30 p.m. 3:30-4 p.m. 4-4:30 p.m. Any Time 2-4:30 p.m. Please select for me. Wednesday 6/19 7-7:30 a.m. 7:30-8 a.m. 8-8:30 a.m. 8:30-9 a.m. 9-9:30 a.m. 9:30-10 a.m. 10-10:30 a.m. 10:30-11 a.m. 11-11:30 a.m. 11:30 a.m.-12 p.m. 12 -12:30 p.m. 12:30-1 p.m. 1-1:30 p.m. 4-4:30 p.m. 4:30-5 p.m. Any Time 7 a.m.-5 p.m. Please select for me. Thursday 6/20 7-7:30 a.m. 7:30-8 a.m. 8-8:30 a.m. 8:30-9 a.m. 9-9:30 a.m. 9:30-10 a.m. 10-10:30 a.m. 10:30-11 a.m. 11-11:30 a.m. 11:30 a.m.-12 p.m. 12-12:30 p.m. 12:30-1 p.m. 1-1:30 p.m. 1:30-2 p.m. 4-4:30 p.m. 4:30-5 p.m. Any Time 7 a.m.-5 p.m. Please select for me. Special instructions or anything we should know about when scheduling a photo shoot time for you. We'd love to hear your thoughts on life as an NP, your favorite part about AANP and conference, words of wisdom for the next generation of NPs and anything else that's on your mind! From focus groups to photo shoots, there are times that AANP needs your input or participation. Sign up for the volunteer list to be notified of these opportunities and be one of our go-to members!